Create reusable patterns and modules by leveraging the new features of Node.js . Understand the asynchronous single thread design of node and grasp all its features and patterns to take advantage of various functions. This unique guide will help you get the most out of Node.js and its ecosystem. 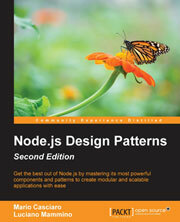 Basic knowledge of Node.js is also helpful to get the most out of this book. In this book, we will take you on a journey across various ideas and components, and the challenges you would commonly encounter while designing and developing software using the Node.js platform. You will also discover the "Node.js way" of dealing with design and coding decisions. This book takes its intended readers through a comprehensive explanation to create a scalable and efficient real-time server-side apps.